If you have leaky basement walls or a flooded basement that is damp, humid, or wet, there's an easy way to return the space to dry, usable conditions. The process is fast, effective, and cost-efficient, and once installed in your home, leads to lower energy bills and a basement that's warrantied to be dry. For a free estimate on waterproofing your concrete block wall basement, call or e-mail us today! 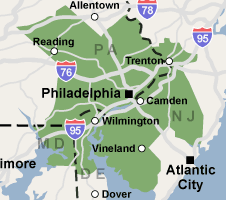 We serve all of Pennsylvania, New Jersey, and Delaware, including Newark, Philadelphia, Reading. This means that it's common to have several small cracks form in any type of basement wall -- even in a new home -- and those cracks are openings for water to make its way through. Additionally, concrete block basement walls hold large open cavities inside that can run up and down the walls. These walls are made out of concrete, a porous material that easily allows water vapor to soak through and enter the basement. If you've ever had leaky basement, a flooded basement, walls or have watched concrete dry, you know what we're talking about. As water passes through the concrete, it can reach the large hollow gaps in block walls or force its way through basement wall cracks. Block wall cavities can fill with water, soaking the concrete and seeping through to the home, and water can push its way through the basement wall floor joint and flood the basement. At Philadelphia Basement Systems, we've seen this problem throughout the region. For a free estimate on a basement waterproofing, call or contact us online today! Repairing wet concrete block walls is part of what the basement contractors at Philadelphia Basement Systems do every day. The basement waterproofing process can be completed in a single day, sometimes two, and involves a sump pump, perimeter drainage system, a vapor barrier, and, in the case of block walls, weeping holes drilled in the block walls. We recommend working with an expert basement contractor, as having a basement leak can be very damaging to personal items stored inside, and repairing the leak can require heavy equipment like a jackhammer. Install a sump pump with a reliable liner in your basement. The sump pump liner should be large enough to allow enough water into the basin that the pump can run a full cycle without turning on and off constantly (called "short-cycling"), which burns out the pump prematurely. A battery backup sump pump should also be included to ensure that your sump pump can run during power outages or a blown fuse. A battery backup sump pump can also offer you protection if your primary sump pump fails for any reason. Click to learn more about sump pumps in Pennsylvania, New Jersey, and Delaware. A trench should be created around the basement floor, leading to the sump pump. If you have concrete block walls, weeping holes should be drilled in the basement walls into each block cavity at the base. This gives the water an appropriate channel out of the walls, sending it to the sump pump. This important basement waterproofing step is sometimes passed over by waterproofers when they're repairing a leaky basement. A PVC drain, such as the innovative French Drain System provided by Philadelphia Basement Systems, can effectively direct flooding basement water to the sump pump while resisting clogging. A wall flange is included in the drain's design that reaches up the basement wall to gather leaks coming from the wall. Laid in a bed of clean crushed stone, the drain is cemented over on top, making for a nearly invisible installation in your home that's warrantied to stop water for the life of the structure (see warranty for details). Once the water has been kept out of the basement and removed from the walls, you can rest assured that you no longer have a wet basement. However, because water vapor will still be absorbed by the concrete and pass into your home, you do have a damp basement! How can this be addressed? One effective and cost-efficient way to prevent wet concrete walls from leading to a damp space is to install a waterproof vapor barrier on the walls. These vapor barriers can be combined with our perimeter drainage system, tucking into the wall flange to direct any water entering from the basement walls into the drainage system. If you live in Trenton, Camden, Wilmington, Cherry Hill, Bensalem, Vineland, Chester and would like a FREE, no-obligation basement concrete block wall waterproofing estimate, call or contact us today! Philadelphia Basement Systems of Pennsylvania, New Jersey, and Delaware specializes in leaky basement waterproofing -- we have the experience, equipment, and best practices you need to keep your basement dry all the time!